Champagne towers are often seen at weddings and other fancy events. Professionals are often brought in to build the tower, however, you can make your own champagne tower with a little bit of practice and patience. 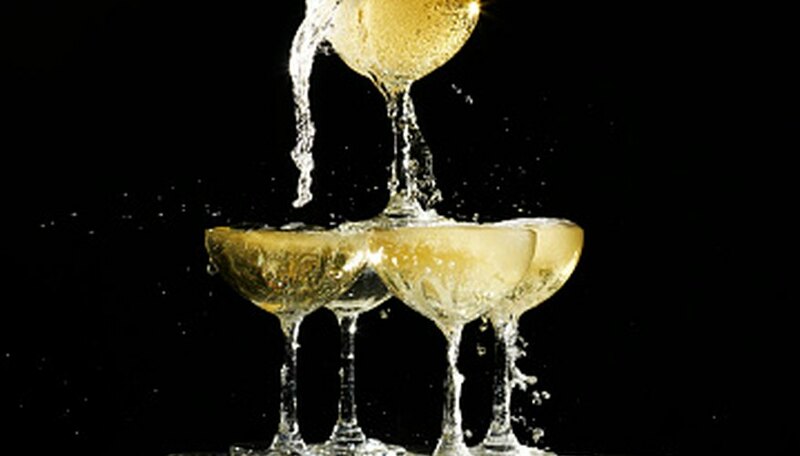 The most important aspect of building a champagne tower is using the right glasses; use the wrong ones and the tower may fall over or the champagne might pour directly onto the floor. Figure out how many glasses you need for your tower. If you are planning to serve champagne glasses from the tower, figure one glass per guest. If it is just for show, determine how large of a tower you are making. Lay out the glasses in one layer on a steady table or surface. Once the glasses are stacked high, you do not want to bump or shake the base. Set out a square of glasses, for example, 8 glasses by 8 glasses. Make sure each glass touches the other glasses on all sides. Place another layer of glasses on top of the first, this time, 7 glasses by 7 glasses. You are building layers on top of each other, each one glass smaller than the last. Continue placing glasses on top of each other, being careful not to knock any down in the process. The final layer on top should have only one glass. Slowly pour champagne into the top glass. Once it is full, the champagne will flow down the sides of the glass into the layer of glasses below. A small fountain may start with a four-square of glasses on the bottom.